Marcelo's Gender and Pop Culture Blog: Gendered Consumer, "Quinn's gift of gender socialization"
Gendered Consumer, "Quinn's gift of gender socialization"
The excitement that toys bring to a child’s life is a fundamental part of a kid’s childhood experience. Toys are a production of pop culture, they can influence socialized distinctions between genders. Socialization occurs, as Newman states, “through a process were people learn to act in accordance with the rules and expectations of society” (pg. 108) Children from a very young age begin to develop and take roles in these expectations that society has set forth. Pop culture, whether we would like for it or not, plays a part in raising our children. Parents can play a big part in socialization of their children with regards to the way that they treat them, for example the kinds of gifts they provide to them As Newman describes in chapter four’s opening scenario, even when parents attempt to shelter their child from gendered distinctions (in this situation toys) it is inevitable; gender socialization has such a powerful and vast presence in our everyday world. Toys are amongst the first few items pop culture utilizes to teach kids the ideal distinctions between boys and girls. 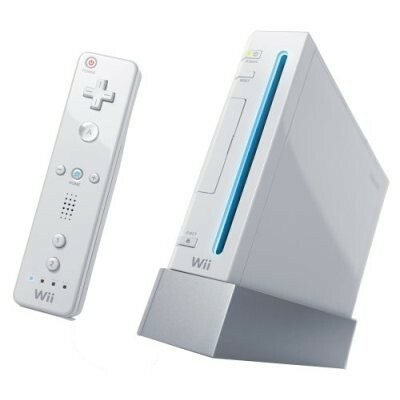 My sons dream gift is Nintendo’s Wii, once of Nintendo’s most recent successes that took the video game market by storm. The Wii uses sensor to capture the motion of the gamer and interprets it into the videogame making it a more physical videogame console than others available in stores. The funds I have available in my account ($232) are not enough to buy my son the gift he desperately seeks. I decided to take into consideration what his favorite pastime is and incorporate this into the gift I will be giving him. Quinn is a very athletic kid so I decided to center my gift on all various kinds of sports. I created a list that is well rounded, and chose the items that fit my son’s personality (and I also must keep in mind that he is 6 years old) the best while sticking to my budget. Also since I had giving him an Xbox 360 the previous Christmas I will take advantage and utilize this console so he does not get tired of it and makes it go obsolete (can be viewed as a substitute for the Wii) The items are as follows: Fight Night 4, NBA Live 09, a Nerf N-Strike Long Shot CS-9 Package and a laser tag game. As I began to shop for my child Quinn, the distinctions in toys for boys and girls jumped out at me. Society creates a norm that men must be aggressive, strong, and athletic. Men tend to majority of the time lean towards sports (watch, play, etc) or violence (movies, shows, games, etc). Walking through the a Toys R’US conscience about the idea of socialization can drastically transform your shopping experience an innocent act of giving to becoming and activity that will aid gender distinctions. What I noticed was that Toy’s R Us breaks down aisles in regards gender distinctions (some not all). The items I was shopping for were in close proximity to each other and any item around it was meant to trigger a male’s attention. 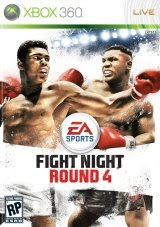 Fight Night 4 is a videogame that allows a gamer to compete in a boxing match as the boxer of their choice, in any weight. Many would argue with me that a boxing game would not be the ideal gift for Quinn but I beg to differ. We now live in the 21st century; kids have endless amounts of resources that can expose them to violence. I believe that by protecting and sheltering a child they will lack the capacity to understand an act of violence (for example a fight) but instead by allowing them exposure while addressing the issue to them, a positive lesson can be learned (fighting is not good nor justified). Since this video game only presents the gamer with the option of choosing a male boxer, the child might be mislead. The child might believe that boxing is only a male sport (majority of the boxers in the sports are male but not all), which we all know it is not. The male child might also believe that it is justified for a boy to get into a fight instead of a girl further creating a dichotomy between a female and a male. This issue as I mentioned earlier, can be addressed and clarified by a parent. NBA Live 09 is a basketball game that is released on a yearly basis with updated rosters and new features that previous games did not have. This game is very aesthetically appealing to kids due to the reality factor in the game. The videogame also during game play allows for an option that gives you pointers on how to set up defensive and offensive plays. The game can help a child who has an interest in the sport educate himself on how to read and manage a playbook. This can come in handy if in the future a child practices the sport with a team. Gender distinction can also be accredited to this game. Since none of the teams have any female basketball players, a child can believe that this is a male sport. Newman warns, “The gender messages in such games may have a detrimental effect on boys’ attitudes toward girls and women and on their conceptions of appropriate male behavior (91). They might also get the idea that due to physical nature of the game, females are not interested or even worse allowed to play. There are no videogames with WNBA rosters in them and even if they were available I believe a boy would not find much interest in it. Taking part in a competitive sport can then be personified as screening masculinity. 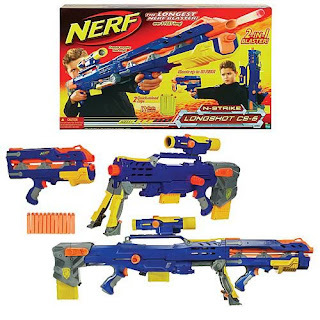 The Nerf N-Strike Long Shot CS-9 Package consists of 3 separate toy guns or blasters/rockets as Nerf describes them. The bullets are made of foam so that when someone is shot no harm can be done to them. All of the Nerf advertisements show boys enjoying themselves and having a swell time shooting one another. I did not see one Nerf packaging or advertisement that showed a female playing with the toy. When kids now think of a criminal or a officer (someone who uses a gun) either or who carry a gun they will now jot down in their memory that having a gun is a male trait. It further demonstrates the association of violence, hostility and power. The person with the gun in this situation has all the power and can take out their aggression with an act of violence by pulling the trigger. Although being shot by a Nerf gun can harm no one, mentally a child can develop his opinions about the idea of carrying a gun. The final gift I will be looking at is a standard Laser tag set for more than one person. 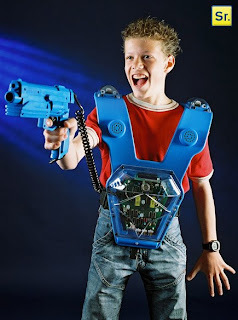 The laser tag set consists of a vest that is activated when shot by the gun (a laser triggers the vest). When the person is shot the vest will light up and a sound will go off. Eventually, after being shot numerous times the vest turns off and you are declared “dead.” This goes on until there is one victor. Quinn will be able to have friends over, which I assume will most likely be boys, and fulfill every little boys daydream (being able to shoot at one another without any of the negative consequences such as death) in a stable environment. Toy manufacturers take advantage of gender socialization in their particular market. Generally, girls begin to take interest in toys such as Barbie dolls, which creates this predisposition that women have a tendency to focus on their physical appearance (pop cultures definition of beauty). Boys take interest in games such as 1st person shooters, sport related games (sport video games, etc), and violent RPG (Role Playing Games). Gender distinctions become more progressively profound in games that are rated higher due to its content. The gifts I have bought my son will in fact contribute to gender socialization, but then again most popular toys will too. Pop culture has made it impossible to shelter their child from gender socialization, I just do not see any way around it. Newman, David M. “Learning difference: Families, Schools, and Socialization.” Identities and Inequalities: Exploring the Intersections of Race, Class, Gender, and Sexuality. Philadelphia: The McGraw-Hill Company, 2005. Print. I can see you've been trying to grapple with contextualizing the many very strong (and very violent) messages sent to young boys through the toys that you found marketed to Quinn's demographic group. I love the title and the examples you've found are quite indicative of the strong messages toys convey to children and their parents about what it means to be masculine in the normative sense in the US. Although you were shopping as though you were your fictitious child's father, you seemed to interpret this assignment as a sort of parenting role-playing task. You mention the need to explain to the child about violence (in the paragraph about the boxing game) and the idea of "getting around" the gender messages in the conclusion. Both of these sentiments are more judgment-oriented than analytically oriented. I don't mean that you were trying to harshly decide what's "good" or what's "bad" in your assignment; however, you did seem to take this shopping role into the realm of how you'd potentially parent this child if he was your son. I think this aspect of your line of thought may have contributed to your understanding of the assignment when you sat down to write after having shopped as though you were the child's parent. While I largely agree with your vision of the ideal parent as able to sit a child down after playing with a particular game/toy to contextualize the messages sent and use the experience as a learning tool, many (if not most) parents do not do so. Additionally, time spent away from the parent/caregiver in school or with friends means that this opportunity is not necessarily even one that is known to the parent. Because the toys send such violent messages to young boys about what it means to grow up and become "a man," in contemporary US society, and parents aren't always willing or able to contextualize violence for their child (pragmatically due to distance and time, or because they too are gendered subjects who may not be alarmed or even notice such prevalent violence in their child's toys because they're desensitized to violence in "boy's toys" too). 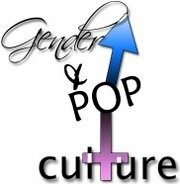 Thanks for being a part of Maymester 09 Gender & Pop Culture! I enjoyed the class & I hope you did too!